Schedule a complimentary consultation for specific pricing and details. Every seventh treatment is at no charge. 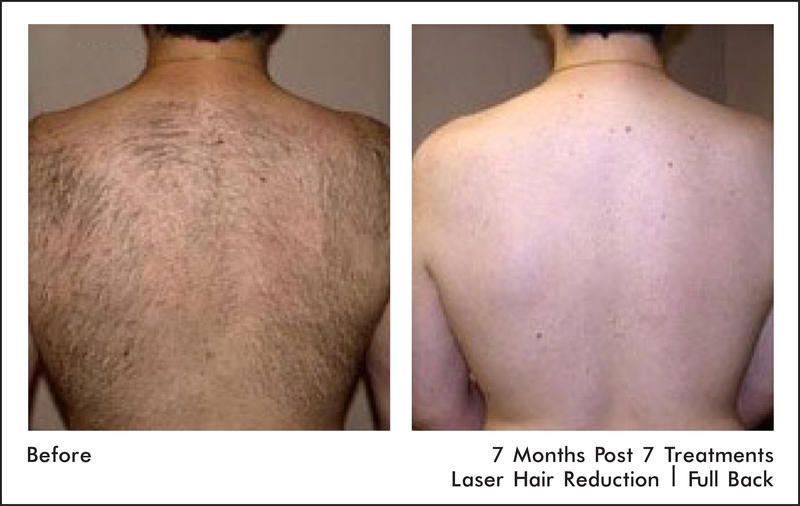 Laser hair reduction is a concentrated beam of light that is pointed at the hair follicles. This light is then absorbed by the hair’s pigment, which causes damage that prevents the hair follicle from growing. Because of this, laser hair reduction will not work on light colored hair. Coarse, dark hair responds best to the treatment. Since each hair follicle has a different growth cycle, multiple treatments are needed. To get the best results, it usually takes 6-8 treatments, however more treatments may be needed for larger areas. Smaller areas may see results in fewer treatments. Treatments are spread about a month apart, and while it can take a while to see the results, there should be a 50-70% reduction after the first few treatments. Unlike waxing, you don’t need to grow your hair out before your appointment. It’s best to avoid tweezing or waxing for up to three weeks prior to your appointment. If you have longer hair, try to shave it the day before. While very effective, laser hair reduction is not entirely pain-free. The pulse of the laser feels similar to the snap of a rubber band. This pain does decrease the more sessions you have, as the amount of hair reduces. Your skin may feel a little irritated afterwards, but it’s very easy to soothe the skin with a hydrating treatment. Enza Essentials Nutri-Gel is a great choice since it is very soothing and great to use all year. Most patients will see an 80-90% reduction in hair growth after 6-8 treatments. The results are permanent.